Nazareth Village is an open air museum in Nazareth, Israel, that reconstructs and reenacts village life in the region of Galilee at the time of Jesus. 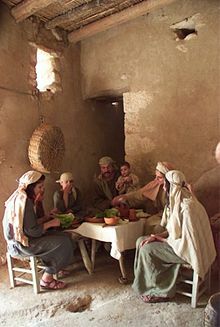 The village features houses, terraced fields, wine and olive presses all built to resemble those that would have been in a Galilee village in the 1st century. Living history enactors dress in period costume and show visitors how farm, domestic, and craft work was performed two thousand years ago. Nazareth Village offers a unique synthesis of historical, archaeological, and ethno-archaeological science applied towards reconstructing a First Century Village upon some of the last natural landscape in Nazareth. With a dedicated staff and a vital volunteer program, it continues to offer a meaningful social forum for people of different backgrounds to work, educate, and share in something special, while preserving an ancient landscape for future generations to learn from and enjoy. The reconstruction of Nazareth Village - from archaeological research and excavation to building the village itself – is an ongoing process. This village presents the life, times, and teachings of Jesus of Nazareth for all the world. It is located on a site that was remarkably untouched and unchanged for the past 2000 years. In fact, Nazareth Village preserves the last remaining fields worked by Jesus' friends, family and fellow villagers. For more go to: NazarethVillage.com. SONshine Ministries has been a supporter for the Nazareth Village Ministry and invites you to join us as we support this ongoing minstry in Israel!